So a lot of people know Alex from the band Clazziquia/Clazziquai Project as the male vocalist or from the 2008 comedy program We Got Married, where he was “married” to model Shinae. Alex a.k.a Mr. Romantic released his first solo album while on the program,June 13. The album starts off with the slow ballad, 어느새. What is great about this song is that it builds up,but isn’t so overtop. It’s a light mellow way to bring in the album. 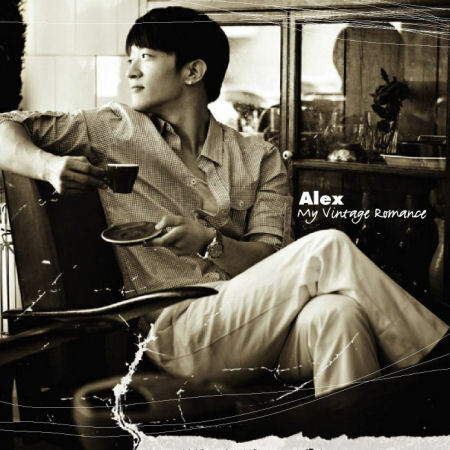 The title track,그대라면/If it’s you has a familiar melody and Alex’s voice shows a bit more power than in the latter. The accompaniment of the violins and piano are a nice touch. 넌 언제나 /You Always(feat. Thomas Cook) is very summer time-y. It’s light and makes me feel like I’m sitting outside, in a field of daisies sipping a glass of lemonade. The guitar definitely makes this sound mature and it has just enough without making it sound like I’m sitting around a campfire. The opening notes of 기다리게 해서 미안해요/Sorry for Making You Wait reminded me of the ’90’s group Sechkies’ song ‘Couple’. This is a very 90’s song, with the sound of the piano and of course, Alex’s voice is soothing. I really want to like 발끝을 적시는 눈물 /Tears that wet the tip of my toes ,but it seems like the melody doesn’t really know where it’s going ala This Is Who I Am by BoA. Feel Like Making Sunshine is exactly what’d you think it would be: chill mixed with a tad of pop beats. One of my favorite tracks, 깍지껴요/Empty Shell(feat. Gaeko from Dynamic Duo) gives Alex some R&B beats. I like this song and the ‘come with me’ bit in the beginning is cute. The thing with the first six songs is that they were starting to blend together and this is what stood out in my mind when I remember listening to the album the first time. Gaeko’s rap was very fitting and didn’t take over the song, but had enough flavor that I remembered it. Great track! 연인/Lover sounds like Flower Pot taken an octave higher in the intro. This song is pretty forgettable. The intro of this song with the building violins is what I love about 사랑하오/I Love You, well that and the softness of Alex’s vocals in the verses. I love the way he says ‘geudae’; it reminds me of Smokie Robinson. Daydreaming is the only fully English song from the Korean-Canadian. This is one of the few slow songs I can stand on this album. This song is another favorite, the simpleness of it is great. Just Alex and his piano. Miss. Understand (feat. Simon Dominic) begins with Alex’s smooth voice and then has this wonderful rap by Simon Dominic from Supreme Team. The arrangement of the song is so dreamy; I feel like I’m floating when I listen to this. 데이지/Daisy is a good soft rock song. I like how different Alex’s voice sounds with the electric guitar. If you were a season 1 watcher of We Got Married then you know this as the Romantic Couple’s song or if you listen to Loveholic then you know 화분 /Flower Pot(Bonus track). This song is so sweet and heartbreaking and everytime I hear it I tear up a little, remembering the couple departing.